CONCERT REVIEW: Akiko Dohi’s recital in Long Beach explores many faces of the pentatonic scale. Concert pianist and noted music lecturer Akiko Dohi brought a fascinating program to the First Congregational Church in Long Beach on Feb. 21. Akiko Dohi is known her mastery of tonal structures, as well as for her recitals, lectures and compositions. She has taught piano and music theory at colleges in the U.S. and Japan. Her lecture and recital covered contrasting pentatonic or five-tone scale patterns and harmonies from different parts of the world. 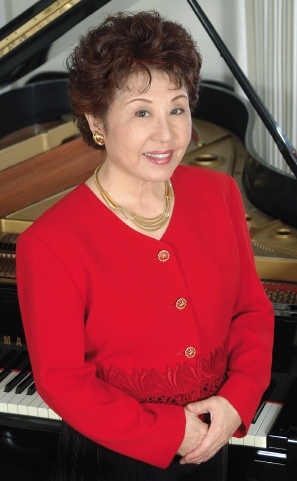 The event, held at what is often called “the Church of the Arts and Social Justice,” included a discussion of Dohi’s latest CD, “Sakura — East Meets West: Pentatonic Music for Piano,” a product of her years of lectures and recitals at many colleges and universities. Her in-depth explanation about eight different kinds of pentatonic scales and harmonies took the audience from Japan to Africa to Indonesia to Thailand, even to Scotland with “Auld Lang Syne,” and ultimately to the classical music she performed, demonstrating how unique and important these pieces are to the world. Dohi’s performance featured works by composers including Debussy, Bartok, Ginastera, Halsey Stevens and Kiyoshige Koyama, as well as her own title piece, “Sakura Fantasy.” Her treatment of the music ranged from delicate soft tones to quick, rhythmical interplay to gorgeous, dramatic sounds housed within well-balanced musical execution. Dohi delivered a uniquely stunning recital and lecture, as evidence of her musical accomplishments. “Sakura — East Meets West: Pentatonic Music for Piano” is available through http://CDBaby.com.